A swimming pool is a great addition to a residential property. The poolscape provides hours of fun and becomes the perfect space to lounge around with family and friends. The one way to make sure that you are able to use these spaces in a more functional manner is to get a pool deck installed in this space. We at Rou Pavers are one of the leading companies in the hardscaping space and have created a distinct niche for ourselves in the industry. 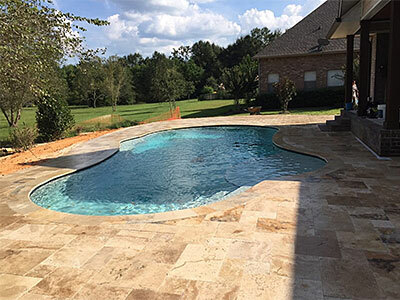 Our company has handled a significant number of swimming pool decking projects for clients in and around Pensacola, Golf Breeze, Pace, and Milton. The expert pool designers on our team have designed and constructed impressive pool decks on properties in Navarre, Navarre Beach, as well as Pensacola Beach. We are ICPI-certified installers and clients from across Fort Walton Beach, Baldwin County, and the surrounding areas trust only us for all their hardscaping requirements. Singe Level - If you have a very compact yard and want a small yet functional space around the pool, a single level deck is perfect for you. This deck may be built adjacent to the pool or could be an extension of the indoor areas of your home too. Multi-Level Pool Deck - Some people like the idea of having multiple levels in their deck. We can design an aesthetically-appealing and practical feature that is proportionate to the available space in your yard. We can also incorporate in-built tanning ledges and private sunning zones if required. You have the option to choose from pool decking materials such as timber, aluminum, composite or a paver deck. If you are looking for paved pool deck contractors that will cater to your specific needs and give form to your ideas, we are the company to come to. Regardless of the type of swimming pool deck you opt for, you can rest assured that the solutions we provide will be right in line with your needs. We have the skill, expertise, knowledge and the resources to create superb installations for you. For any more information on our services and pool deck cost, feel free to contact Rou Pavers at 850-791-5641. You can send us your project details via this Contact Us form or request a free estimate and one of our experts will get in touch with you shortly.